Kasey Kahne won the Good Sam Roadside Assistance 200 as NASCAR returned to Rockingham Speedway for the first time since 2004 on Sunday afternoon. 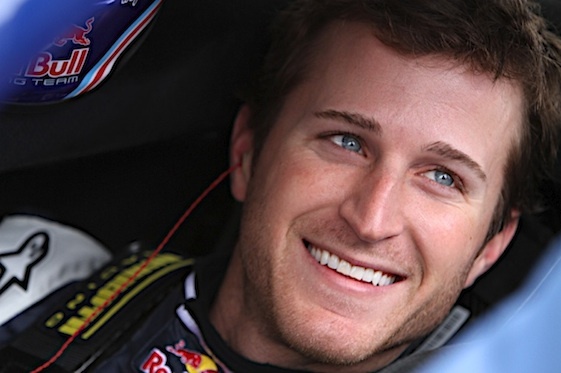 Kahne moved to the front on the lap 155 of the 200-lap event to notch his fourth win in five starts in the NASCAR Camping World Truck Series. The victory gave Kahne his third top 10 finish of the weekend as he was third in the Nationwide Series race on Friday night and seenth in Saturday night’s Sprint Cup series race, both of which were held at Texas Motor Speedwaay. James Buescher finished second with Matt Crafton third. Pole-starter Nelson Piquet Jr. dominated the early stages of the race, leading 85 of the race’s first 100 laps. But Piquet became mired in traffic after a lengthy pit stop shuffled him back to fifth during the race’s third caution. He worked his way back to second place until incurring a pit-road speeding penalty during the final caution period. He rallied to finish seventh. John King’s grasp on the series’ points lead fizzled early in the race, when he spun and nosed into the inside wall on the backstretch on Lap 4 to bring out the race’s first caution. King returned to the track after repairs, but wound up completing finishing 33rd.